The Disney movie Pete’s Dragon is undoubtedly by storm. But the 2016 movie is actually based on a musical that came to life in the late 1970’s. 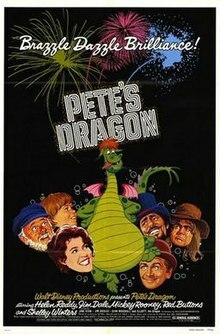 Pete’s Dragon was a 1977 American musical live-action animated film directed by Don Chaffey, produced by Jerome Courtland and Ron Miller, and written by Malcolm Marmorstein. Desert Chica has a great idea on how to Make your own Elliot with this easy Pete’s Dragon craft using a pool noodle & craft supplies! Give your own little Dragon flight with this DIY Cheerios box dragon wings activity! Then round up everyone and head for the kitchen to enjoy a little Dragon-inspired cooking. My Dragon Bread recipe is sure to please! And while your at it, learn a little more about Dragons and how they are not only among us, but simply not as fierce as everyone thinks! My newest book, Dragons are Real is available and the excitement is almost blowing the roof off at Jump Into a Book/Audrey Press headquarters!